Tidy Up Your Gift Cards Before It’s Too Late! People keep a SHOCKING number of gift cards for WAY TOO LONG then complain when a gift card is no longer valid. Get organized so you’re more likely to get all the value from your gift cards. 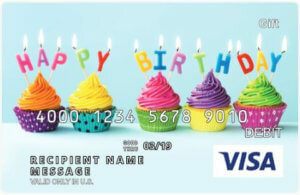 Buy Visa® Gift Cards and Mastercard® Gift Cards Usable Almost Everywhere. Free Guide! Tidy Up Your Gift Cards Before it’s Too Late! In 2015, CEB reported that close to $1 billion in gift cards went unused the year before. Though new gift card statistics on this issue are difficult to obtain, I am guessing that number is low. I don’t have statistics to quantify my thoughts, but the more I talk to consumers, the more I realize that people keep a shocking number of gift cards for far too long. In my opinion, a gift card is only valuable if you use it. It’s not a debit card that provides access to all of the money in your bank account. And it’s not a credit card that can be saved for emergencies or used responsibly to build a credit score or earn free airline miles. A gift card is simply an “I owe you” (IOU) for a present that you’re supposed to pick out for yourself. Not spending that IOU often leads to potential problems. The longer you hold onto a gift card, the more likely you’ll lose the card, forget to use it, find out the balance has been reduced by fees or discover that the gift card is no longer usable. I know this because I answer gift card questions every day and people are always asking what to do if a gift card is lost or the balance of a gift card is gone–both situations that can be avoided by using gift cards quickly. FREE GUIDE: How to Tidy Up Your Gift Cards Before it’s TOO LATE! A reporter recently asked me to comment on a story about customers who got stuck with useless gift cards when a small meals-to-go service went out of business. One woman complained that her $500 gift card with over $300 left on it could not be used. She lamented that friends and family had collected money to help her buy meals during a difficult time in her life and now their hard-earned money had gone to waste. She shared the injustice of losing the value of the card and blamed the business. And I was right there with her–offering my condolences and a few long-shot suggestions for getting her money back. But when the story ran, I read the full report and discovered that the woman citing the loss had received the gift card 4 years prior! Now I am an advocate for consumer rights when it comes to gift cards. I regularly report on businesses in chapter 11 to help people use their gift cards quickly when stores are in financial trouble. I am THIS CLOSE to going “Legally Blonde” over stores knowingly selling gift cards moments before announcing bankruptcy. Trust me when I say that I monitor the gift card programs at stores and restaurants to make sure I know how to help consumers when gift cards don’t work as planned. So that’s it. Starting now, I’m launching an official crusade to encourage consumers to get their gift cards together, to use them, and to establish a practice of always using gift cards received as soon as possible from now on. Here’s my system for doing just that. The solution is simple: Gather your gift cards, check the balance of each one, decide how you’ll redeem each one, and use the cards immediately or put them where you will be ready to spend them at the next opportunity. That’s all there is to it. 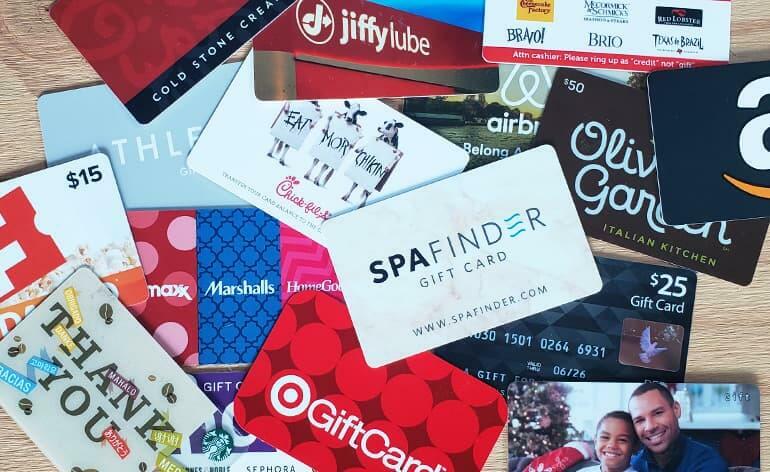 As you go through your pile of gift cards and listen to my gift card tips, however, I’m hoping you will stop “saving gift cards for a rainy day” and adopt a new practice of using the gift cards you receive as quickly as possible. Let’s get started. Look for unused gift cards in your wallet, purse, desk drawers and sock drawers. Get ‘em all out. Check for unused egift cards on your smartphone, email and social media accounts as well. This is the easiest part. Once you have your gift cards gathered, sort them into the categories listed below. If you’re not sure where a gift card falls (e.g. Where should I put my Uber gift card?”), put it in the “other” category. Finding the perfect category is less important than getting all your cards in front of you so you can start thinking about how you’ll use them. On the back of each gift card, you should find a telephone number to call and/or a website address to check for balance inquiry, expiration and usage information. Using the downloadable gift card worksheet, record the name, balance and expiration date (if applicable) of every gift card you own. Read the fine print on each card and make a note of any restrictions. For example, some egift cards may only be usable online. Some physical gift cards are only usable in stores. With the gift cards gathered and organized into categories, the next step is to think about how you’ll use each one. In addition to redeeming the cards, the list below includes several ways to repurpose gift cards you’re not likely to use. Now remember, the goal of this step is to finish with a plan to spend, sell, give or regift every gift card you own, as quickly as possible. Use the Tidy Up Worksheets to help you get organized. And just to be clear… I’m not suggesting a mad dash to the store. I just want you to recognize that saving gift cards for an unknown future date is not the best way to get the most value out of your gift cards. Also, this is a time to be honest with yourself. If a gift card in your wallet has gone untouched for over a year, you probably aren’t going to use it. So make a plan to repurpose the gift card instead. Redeem the gift card: Treat the gift card like the gift it was intended to be by spending it on yourself. Go out to dinner, buy a new blouse or book that spa treatment you deserve. Sell the gift card: Reputable gift card resellers buy national brand gift cards for less than face value. If giving up a percentage of the balance bothers you, remember that getting some cash back is better than holding onto a gift card you will never use. Re-gift the gift card: If a gift card doesn’t work for you, regift it to someone more likely to use the card. Just double-check the card’s balance and expiration date before wrapping it up with a bow. Buy a present for someone else: Think of birthday parties, graduations and other gift-giving celebrations on your calendar. Use a gift card to buy a present you would have had to buy anyway. That frees up your cash for other needs. Donate the gift card: Donate a gift card to a local school, shelter or non-profit organization and ask for a donation receipt for your taxes. The recipient can redeem the gift card for supplies or raffle it off at the next fundraiser. Buy items to donate: Rather than donate the gift card itself, use it to purchase items to donate instead. Books, batteries, blankets, socks and hygiene products are popular items on donation lists. This is a good way to use a gift card that is about to expire. Give it away “Just Because:” Give a restaurant gift card to a college student, a movie gift card to a single parent or a spa gift card to a hardworking teacher. Hand a grocery store or fast food gift card to someone in need. You don’t need a note or a reason, just give the gift card to someone who needs it more than you do. Cash it Out: In some states, stores and restaurants are required to cash out merchant gift cards with balances below the state-mandated threshold. In California, for example, once a gift card falls below $10, the merchant is required to give the customer cash back for the unused portion of the gift card. Check your state gift card laws to see if a gift card can be cashed out. When you receive a gift card, the most important thing to do is read the terms and conditions so you know when and where the card must be used. Then you have to make a plan to use it. Here are some other things you might want to know about gift cards. Fees after 12 Months: Under federal law, if a card is not used for 12 consecutive months, a monthly non-use fee may be deducted from the balance starting on the 13th month until the balance is $0 or the card gets used. So the clock on that gift card you got for Christmas has already started ticking. Expiration after 5 Years: Under federal law, a gift card or general purpose prepaid card (e.g. 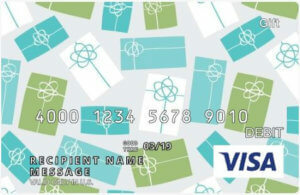 Visa gift card, Mastercard gift card, etc.) generally may not expire less than 5 years from the date of purchase. These restrictions don’t apply to reward cards and promotional gift cards. Some states prohibit expiration and fees on merchant gift cards. 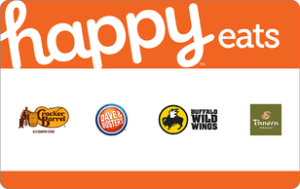 Many stores and restaurants voluntarily issue gift cards that have no expiration date and are fee-free. Again, there are other gift card laws, but these are the two that consumer write to me about most often. For additional information about state gift card laws, you can refer to this chart by NCSL which is an attempt to summarize state gift card laws, but is not intended as legal advice, and may not apply to all types of cards. The saying, “out of sight, out of mind,” pretty much describes the main reason people forget to use their gift cards. Once you have a plan for using each outstanding card, the next (most important!) thing to do is follow-through. Start using the cards, list them for sale or at store the gift cards where they will stay top of mind. Keep gift cards next to bank cards. 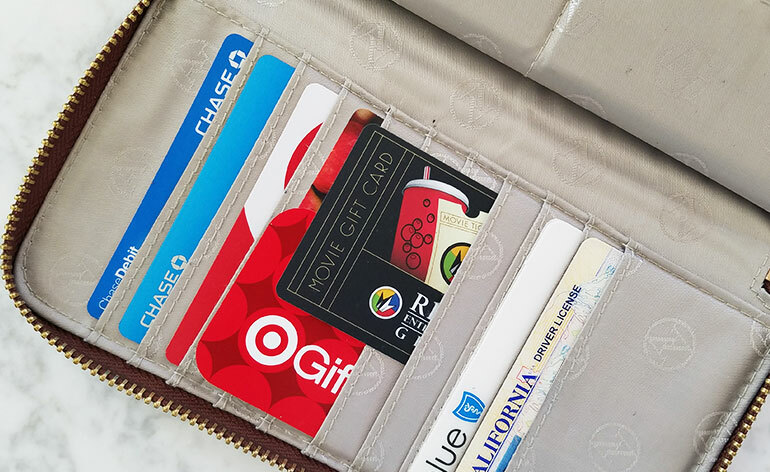 Store gift cards in your wallet next to the debit or credit card you use most often. That way, when you reach in your wallet to grab your debit card, you’ll be reminded to spend that Visa gift card first. Keep your gift cards all together. 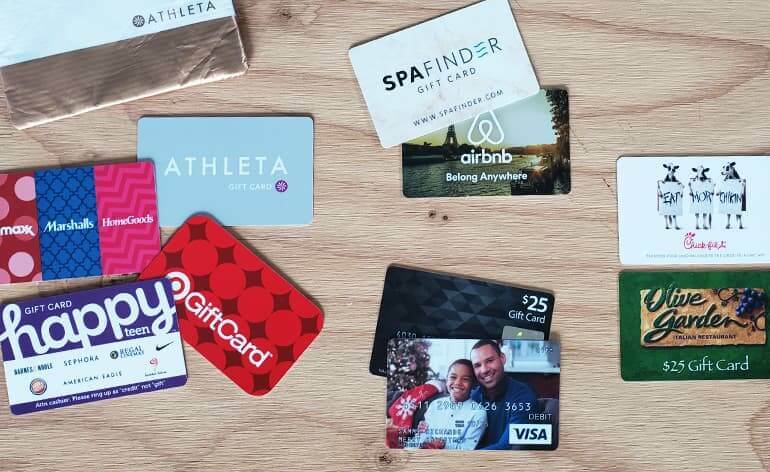 Tossing some gift cards in your desk, others in a drawer, and still others in your wallet means you never have a full picture of all of the gift cards you own. And it’s hard to make a spontaneous redemption (“Oh, look…I have a gift card to Anthropolie, let’s go in there.”) when your gift cards are “somewhere” back home. Keep gift cards next to your computer. Store gift cards you plan to use online next to your computer or where you charge your phone. When you start online shopping, check the stack for gift cards you can redeem. Add gift cards to your mobile wallet. When possible, add egift cards or a digitized version of the plastic gift cards to your mobile wallet. You may not be able to use the gift card directly from the wallet (sometimes you can), but it’s a good back up and visual reminder of the gift cards you need to spend. 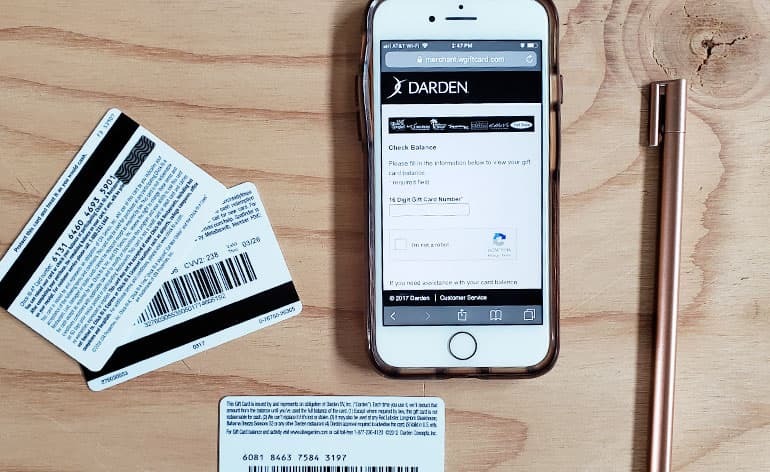 Store images of gift cards on your smartphone. 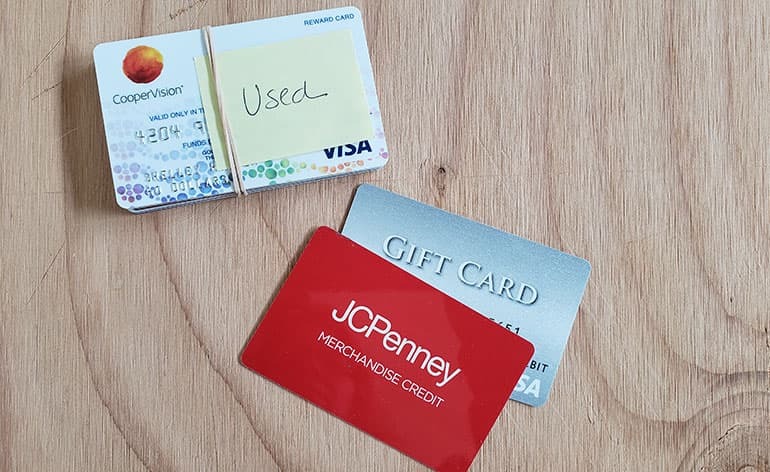 Again, you may not be able to use the images as payment but storing images of unused gift cards on your phone (in a marked folder) will keep gift cards top of mind and is a nice backup if you happen to lose the plastics and need to order replacement cards. Flag or mark egift cards in your inbox. 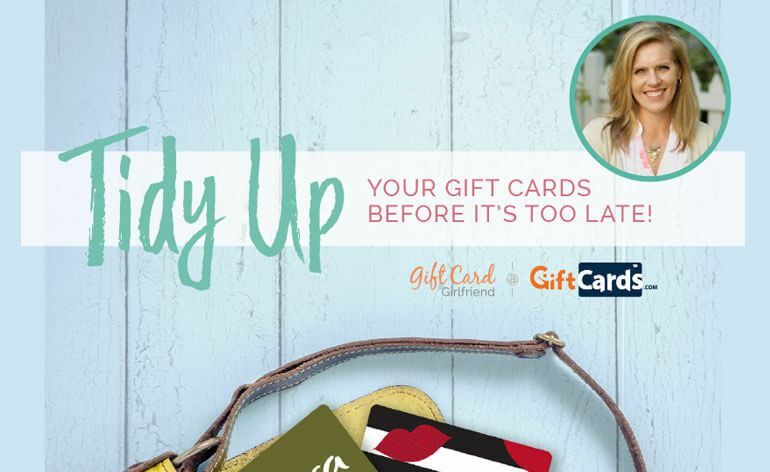 eGift cards stored in an overflowing inbox are easy to forget about or accidentally delete. As soon as you receive an egift card, move it to a marked file folder, flag it for follow-up, or create some other digital routine that works for you. If you receive it on a smartphone, add it to your mobile wallet immediately. Add gift cards directly to merchant accounts. Where possible, redeem gift cards immediately by adding the credit to your merchant account. Amazon, iTunes, Starbucks and other merchants make it easy to redeem a gift card now, storing the credit for your next transaction on the site. My preference is for you to use cards quickly but creating a system that allows you to store the cards temporarily is a good choice as well. In addition to storing gift cards where they will stay “top of mind,” set a date to use each gift card. Add a note to your calendar or set a reminder in your mobile device to help you follow through. I often add events to my calendar with little reminders such as “2/15 12PM SUBWAY GIFT CARD LUNCH.” Trust me, it works! A gift card can be safely tossed or deleted when you are certain that items purchased with the gift card will not need to be returned. If you return an item purchased with a gift card, most merchants will issue a refund via a new gift card or a merchandise return card. Some stores, however, automatically credit the card used to make the original purchase without asking the consumer first. If that happens, you might need to know the gift card number in order to access the funds or obtain a replacement plastic. 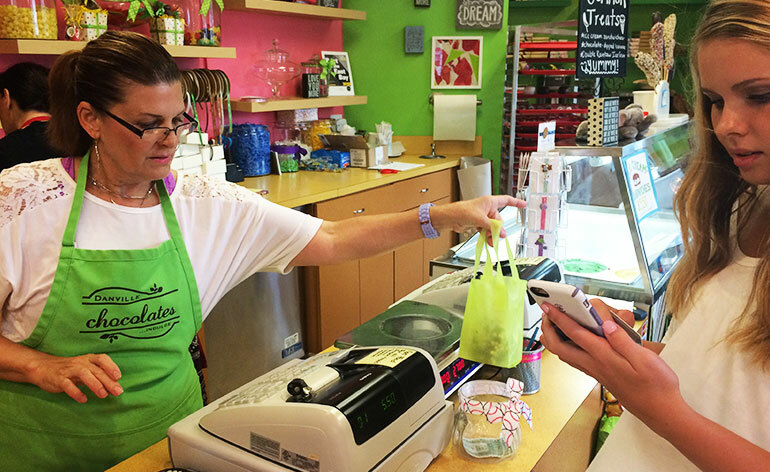 Consumers are often advised to treat gift cards like cash, but few know what that means. It means that a store or restaurant is not obligated to issue a replacement gift card if you lose your gift card. It means that if someone finds your gift card, he or she could redeem the gift card without your knowledge. Although I have seen merchants work with customers to recover lost gift cards and issue replacement gift cards, they are not obligated to do so. So what should consumers do? Think of it this way. If I handed you a $20 bill, you would likely put that money in your wallet immediately. If I gave you a check, you would deposit it in the bank quickly. I’m suggesting you adopt similar practices with gift cards. When you receive a gift card, treat it like cash by putting it in a designated place in your wallet or putting it next to your computer or online shopping. 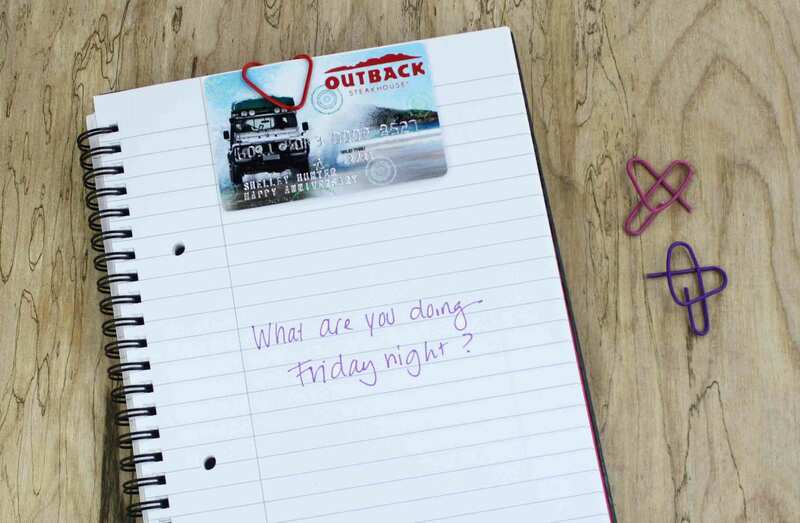 Do the same thing every time you receive a gift card. Don’t leave the card in a greeting card, toss it on your dresser or put it into your pocket. Create a practice of always putting your gift cards where they can be held secure–just like you would cash. Got any other questions about how to use your gift cards? Let me know in the comments below or reach out to me on Twitter (@GCGirlfriend) or Instagram (@Gift.Card.Girlfriend). 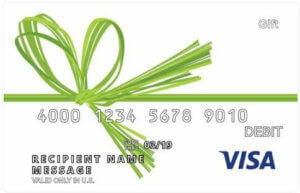 Need Help Using Visa Gift Cards Online? Why Isn’t My Visa Gift Card Working? Do Gift Cards Have Fees and Which Apply to Me?